Italian artist Carlo Bernardini has been working with optic fiber since 1996. 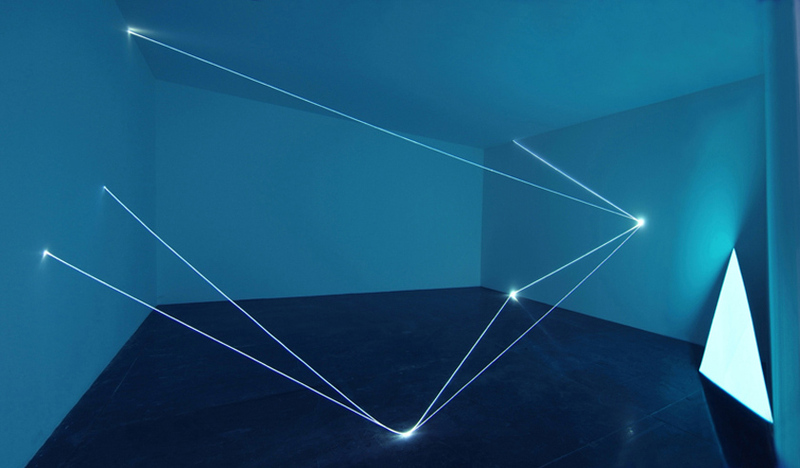 He creates light sculptures or, more precisely, spatial drawings using optical fibers and in a sense sculpts the darkness, reconfiguring the space with his light architecture. He currently has an exhibit at MACRO in Rome called The Corner’s Revenge appearing in the elevator shafts of the building, on different floors, in his trademark style of spatial light drawing. Bernardini’s work has also appeared at the Milan Trienniale, the Naples Quadriennale, as well as at the Palazzo Bertalazone in Torino, and Domaquarèe, Berlin, just to name a few in the past couple of years. You can see more of Carlo Bernardini’s work at his site, as well as here, and in these two flickr photostreams: here and here.